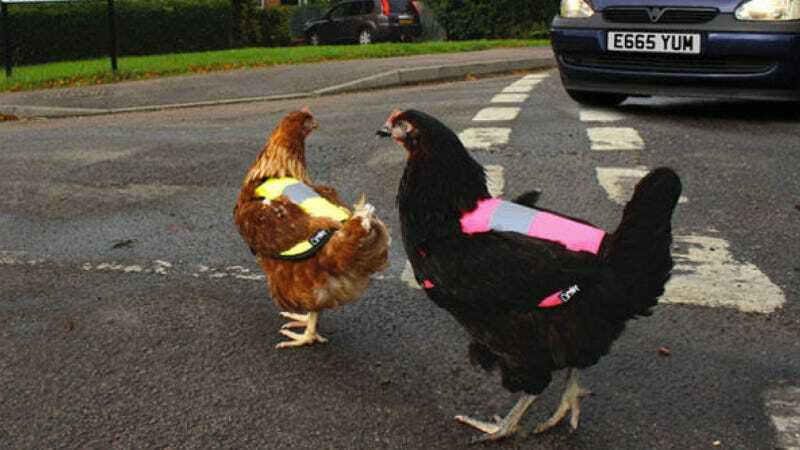 Regardless of why a chicken would cross a road, they can now do so a little more safely thanks to a new range of high-visibility chicken vests available from Omlet, a British pet supply company. Yes, a real company. Selling jackets. That help chickens cross roads. He added: “Most people who have chickens as pets will have them out and about and we do hear about chickens who do cross the road. As ridiculous as this may seem to one who hasn't interacted with chickens, there's actually a lot of utility here. Living next to an amateur chicken farmer myself, I can attest that the animals have little regard for the presence of vehicles, and their feathers are decidedly lacking in reflective qualities. They've been known to play (wait for it) "chicken" (guffaw) with passing cars and have caused their share of brake-lock skids from unsuspecting motorists and the pizza delivery guy. Before you laugh, I'm not the only one who recognizes the danger an unsupervised chicken presents to itself and others— Omlet is currently out of stock in both colors.